Some people look at big things, and other people look at very small things, but in a sense, we’re all trying to understand the world around us. Yesterday we hiked over to Morgan Creek at work to prepare for some upcoming trips with summer campers where we will sample the stream for macro-invertebrates. I am pleasantly surprised at the diversity of critters that still exist in this Piedmont stream. 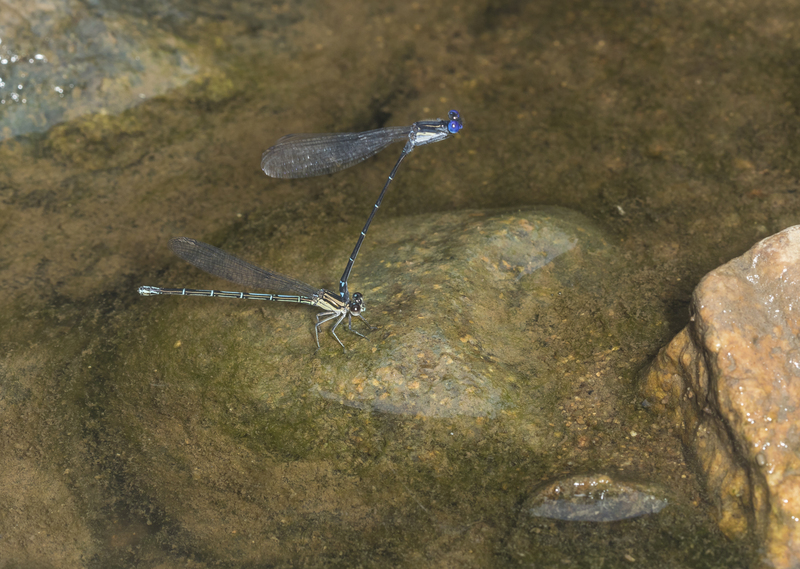 One of the first things to catch my eye was a pair of damselflies in tandem. That is where the male has a clasp on the female’s neck using special abdominal appendages. This is a precursor to their unusual mating behavior, and, in some species, is also carried on through the egg-laying process, with the male staying with the female to protect his interests. In the photo above, the male is the one perched upright and the female is perched on the rock. 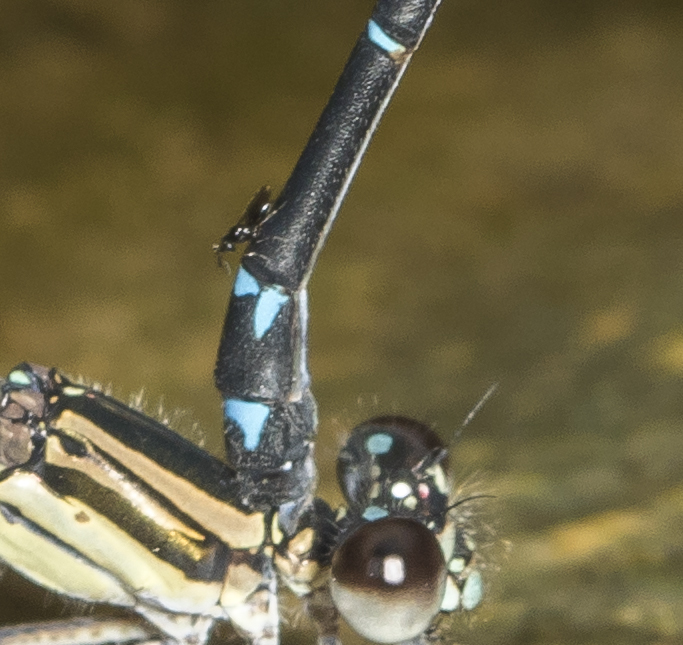 The male is a particularly dark damselfly with only thin blue rings along most of the abdomen. 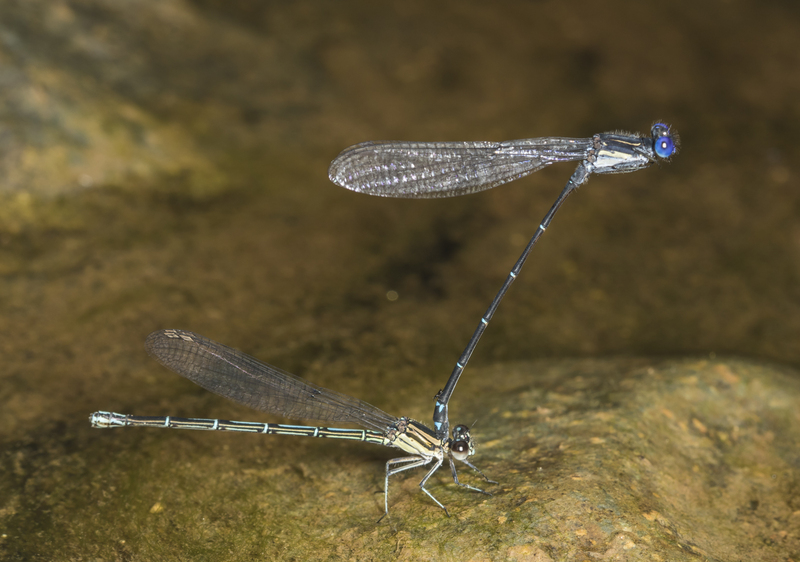 This is characteristic of the Dusky Dancer, Argia translata. This is a widespread species inhabiting streams, rivers, and large lakes from Ontario to Argentina. They are found throughout much of the Piedmont and Mountains of North Carolina, but are generally not considered abundant in any location. I wanted to get some better images, so I kept stalking the pair, and laying down on the gravel bar to try to get a low angle image. …a tiny hitchhiker on the abdomen of the male. In most of the photos, the critter had been camera shy and mostly hidden on the back side. But in this last set, it was visible and I tentatively identified it as a potential parasitic wasp. In searching the web, I found that there are a few species of parasitic wasps (most in the genus, Hydrophylita) that are egg parasitoids on damselflies. 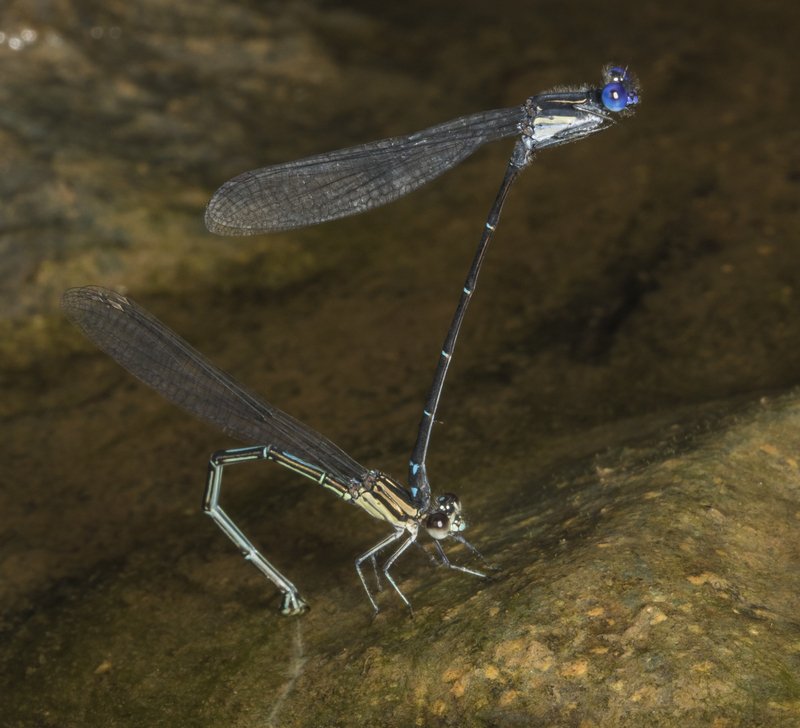 If this is one of them, when the damselfly lays her eggs underwater, the wasps crawls down the abdomen, into the water, and lays eggs within the eggs of the damselfly. The wasp larvae then hatch and consume the eggs of the host. Whoa, the more I learn, the stranger it all becomes! This entry was posted in Natural History and tagged dusky dancer damselflies, egg parasitoid by roadsendnaturalist. Bookmark the permalink. “… they finally stayed put long enough for a couple of shots.” !!! It’s not teensy tinsy whiskey glasses you’re talking about here, is it? I love that aspect of observing nature that when you go out looking for one thing, you often get sidelined by some other unexpected fascinating thing. Tough to know given that description. Best bet is to try to record the call and send it. Any chance you have more pictures of the wasp or, even better, specimens? These look like they could be scelionids, the group that we specialize in. I’ve suspected damselflies as possible hosts, but that’s never been demonstrated. Chalcidoids, yes, scelionids no (not yet anyway). I will send you a couple of images, but, unfortunately, the wasp tended to stay behind the abdomen while I was taking the pix. If you can send me a link to any additional information, I would appreciate it!